The Fruitiest Jellies imaginable. Taste the tang of real strawberry, apricot, lemon, raspberry and pear. Succulent caramels with salted butter and the famous salt of Guérande. Pandora Bell’s caramels are made in the tradiional artisan way, in copper cauldrons. Pandora Bell’s Fudge is rich and crumbly with a generous helping of butter. It is made traditionally, cooled naturally, and broken by hand. Pandora Bell’s Traditional Sweets are created through the artform of stretching and rolling sugar syrup. The only added extras, are natural colours and flavours, which give our sweets their classic sweetshop look and taste. 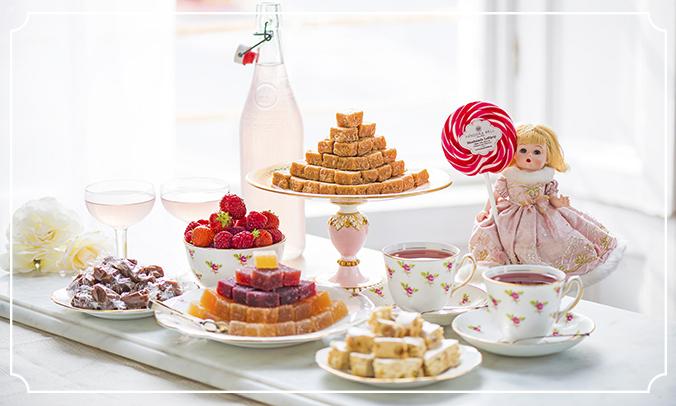 Sugar, spice and hard candy … This timeless sweet treat goes back to a time when colours and flavours were natural. Pandora Bell’s Swirly Lollipops are made in the traditional way, by stretching and rolling sugar syrup. Chic, petite and delicious, Pandora Bell’s Real Eggshell with Praline Chocolate is the ‘must have’ indulgence for Easter. Pandora Bell has gone back to basics, taken a real chickens egg and filled it with the smoothest praline chocolate.